"It is vital that we rethink and reflect on how we respond to the challenges around us", was the main theme of the first dedicated Operational Development conference specifically aimed at the Higher Education sector. Opened by LSBU Vice Chancellor Martin Earwicker, the conference saw representatives from 20 different UK universities – business leaders, academics, OD practitioners and HR professionals – come together to discuss and share ideas on how to adapt to the seismic changes currently taking place in the Higher Education sector. In recent years, the Higher Education sector has faced adversity - most notably with the introduction of significantly increased tuition fees, which has sent universities into a tougher climate, dominated by reduced funding and increased student expectations. 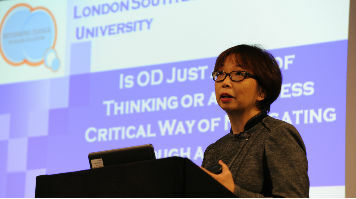 "It is important not just to know who we are, but to know how to bend ourselves to work effectively in times like these", said OD-thought leader Dr Mee-Yan Cheung-Judge in her opening keynote presentation, where she discussed the importance of sticking to the 'core od OD', and how trust is a vital component in developing high functioning organisations. Professor Nick Petford, Vice Chancellor of the University of Northampton during his keynote speech presented the audience with a case study of its own 'Raising the Bar' strategy, which has seen the focus shift to emphasise organisational design, values and behaviour. Petford stressed the emphasis should be on leaders taking ownership and responsibility of the institution through leadership by example. "Leadership by example" was a message which also resounded in 'Viral Change' creator Dr Leandro Herrero's closing keynote speech, in which he discussed the implications for leadership in the 'new Higher Education': "It's no longer a top down but bottom up - grass roots approach. It's not about new processes, restructuring and management musical chairs, it's about behavioural change. Above all, the new Higher Education leader will need to act more and say less". Between presentations, delegates were encouraged to share thoughts and ideas in various interactive sessions, which saw attendees working in groups to explore ways of re-defining leadership and discuss any barriers facing them in their own organisations. "I am so proud to have led this ground breaking OD conference on behalf of LSBU which was current, timely and relevant for the sector", says Vongai Nyahunzvi, Deputy Director Organisation and Staff Development at LSBU.